Tonight is my 50th Christmas Eve, and as it happens I’m spending it mostly on my own (though the kiddo will be joining me before bedtime). It’s a little odd because for most of my life I’ve spent Christmas Eve with family–and this night, to me, has always been “Christmas.” My maternal grandparents, though born in the US (as were their parents) were traditional Polish Catholics who held vigil on the night before Christmas and celebrated at midnight. By the time I and my three sibs came into the picture, the celebration was simplified–an evening buffet with ham and kielbasa followed by some religious observance, and then–presents! Lots of times we kids “camped out” with our loot in sleeping bags not far from the Christmas tree. So, after a year full of change, which finds me single again, in a two-bedroom apartment instead of my former house, and about to embark on the grand adventure of redefining my self, my career, and even my mode of parenting, it seems fitting to me that my bedroom is tonight graced by this authentic vintage 1960s aluminum Christmas tree that once belonged to my sweet and much-missed grandparents, Cecilia and Raymond Zdroj. 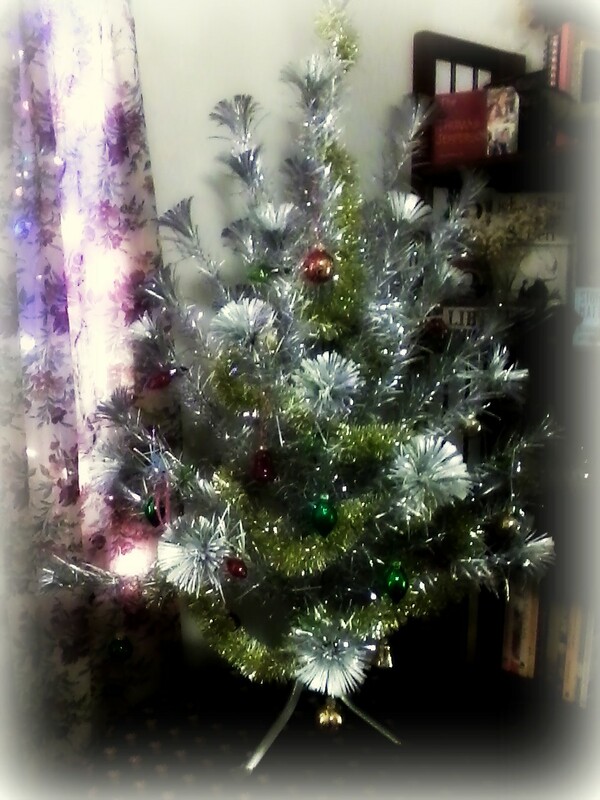 It is a twin to the very first Christmas tree I ever knew, the one that my mom set up in our house when I was a pre-schooler; it weighs less than a pound packed up in its box, and takes 15 minutes to set up. I am no longer religious in the traditional sense … but I do believe in tradition, and in memory, and in keeping a light burning through the winter (especially here in Michigan, where it gets dark pretty damn early). Thinking of you, Grandma and Grandpa, on this, my favorite night of the year. Peaceful and happy winter solstice to all, whatever you may be celebrating.